WEST LAFAYETTE, Ind. — Perseverance paid off for senior Travis Iles as he raced to the winner’s circle in Saturday’s (April 25) 52nd running of the Purdue University Grand Prix. Iles, an industrial management major from Mt. Vernon, Ill., moved into third by the 14th lap, worked his way into the lead by lap 40 and held on for the remainder of the 160-lap race. This is Iles’ fourth Grand Prix and his first win. Senior Travis Iles celebrates his first Grand Prix win. Iles attributed his victory to hard work and conservative driving on the track. “My dad used to tell me when I was younger, ‘Don’t be dumb, be smart.’ So I took a Sharpie and wrote on my roll cage, ‘Be smart.’ I kept looking at that and remembered that. Sean Noonan, a senior majoring in mechanical engineering from Perrineville, N.J., came in second. Noonan, like Iles, was driving in his fourth Purdue Grand Prix. 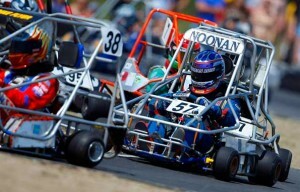 “I’ve been driving go karts since I was 12 years old, so after a while it becomes kind of second nature,” he said. Jake Murphy, a senior majoring in interdisciplinary engineering, and Ben McMurray, a senior majoring in fisheries and aquatic science from Trafalgar, Ind., finished third and fourth, respectively. Runner-up, Senior Sean Noonan, navigates traffic during the race. Official results of the 2009 Grand Prix will be released Monday (April 27) following a standard review by the race’s scoring board. Dustin Keller, a former Boilermaker football player who now plays for the New York Jets, was the grand marshal of the 2009 Grand Prix, which is organized each year by the Purdue Grand Prix Foundation. The foundation is a student-run, non-profit organization that conducts the kart race and related events each year to raise money for student scholarships. The highlight of this year’s race was the brand new track at the corner of McCormick and Cherry Lane. The new track is a 4 feet wider than the previous track, which was used more than four decades. Grand Prix Ambassadors presided over race-related events. They were Rebecca Pankop of Albion, Ind., who’s graduating in May with a bachelor’s degree in nursing, and Max Vande Vaarst of Wayne, N.J., a sophomore majoring in English education and history. Ambassadors serve as spokespeople for the foundation, encouraging race support and business sponsorship and perform other duties. The ambassadors each received a $1,000 scholarship from the Purdue Grand Prix Foundation. Fifteen other students received scholarships ranging from $250-$750. The foundation receives money from Toyota Motor Corp., Coca-Cola, Purdue Intercollegiate Athletics, WAZY 96.5, WLFF 95.3, WSHP 95.7, Purdue Memorial Union, Bosch, Lockheed Martin, Bowen Engineering and Army ROTC.